Sharing another layout about my recent trip to Tuscany, Italy; I just love everything about this amazing region and this time reminiscing about why I love it so much and wouldn’t mind visiting there again and again. What it all comes down to is the breath taking scenery, there’s just something about those rolling hills and cypress trees. And once again using the fun Just Because collection, focusing on 3 main colors red, navy and turquoise (with bits of the other fabulous colors in this collection). Also have some fun with the different chipboard elements and transparency embellishments! And some fun close ups of the embellishments – love those word stickers! And a fun cluster of the transparency embellishments. Love how these have a bit of silver here and there. Thanks everyone for stopping by and a special thanks to Little Yellow Bicycle & Liz for this amazing and super fun opportunity to share here! Be sure to follow Piradee on her blog, The Scrapper in Me, to keep up with all the travel and news she will continue to share with us. Don't forget to run out to your local scrapbook store or Michaels and pick up some of our Naturals to play along in our contest. There is just over two weeks left to enter... See the blog post HERE for detals. PT: My must have tool is your average cutter that you can get at any stationery section/store. I used this for everything, from opening those goodie boxes, to cutting bags of chips and of course for scrapbooking. These are really useful for me to trim/cut the extra pattern papers of my layouts or cards, this way I don’t have to worry about perfectly cutting the papers with the trimmer. LYB: Events or moments scrapbooker? PT: Would say that I’m more of an events scrapper but this year, I’m taking on project life to help capture all those little and/or crazy moments that never quite make it to my layouts/mini album. LYB: Are you a neat scrapbooker or is your space a mess? Hi Everyone, Piradee here again to share another layout using the gorgeous Just Because collection. For this layout, I started with the grid concept, dividing up the layout into various sections. In some of the sections I opted for pattern papers, creating my own little scenery ( love that cute bicycle design and the fun chipboard clouds). In other grid areas, I included the pictures of the “boys” (yes Hubby is a boy at heart) and also a small cluster of elements. To add in some variation against the straight lines of the squares, I included a little half circle for my sub-title and finished off that corner with a little twine. I would say that I’m a clean and simple scrapper but love to add in a little twist here and there. In this case, it’s all about layering (especially with the amazing selections of embellishments that are available in this collection wow). Here’s a close up of the little cluster scenery and of course more silver sequins. And here’s another fun cluster where I first started with one of the journaling tags, then came the chipboard, don’t forget that fun transparency die cut and the must… the pins (and of course more sequins)! We will have one more project to share from Piradee next week, so be sure to visit her blog The Scrapper in Me in the meantime. Don't forget to run out to you local scrapbook store or Michaels and pick up some of our Naturals to play along in our contest. See the blog post HERE for detals. PT: I’m so a night owl and it’s in the evening that I mostly get my scrapping done. I would be procrastinating the entire day only to start around 5pm. PT: That would definitely be my silhouette machine. I remember that it was sitting in the box for about 6/7 months before I first used it and since then, there’s a little bit of silhouette action for all my layouts/projects. PT: It used to be handwritten journaling, but now its typewriter typed. Yeap, with over 10 typewriters in my collection, I got to put them to some good use somehow. I am thrilled to be sharing some Just Because projects this month. I just adore this sweet collection – the mix of the dark pink and turquoise against the navy and also loving the pops of silver throughout the collection. For my first project, I used the fun sketch from this month’s challenge and opted to create an 8.5”x11” layout instead. I kept to the base design of the sketch but switched to one photo (unfortunately less space to play with) and also moved the scallop border to the center. I also included some of the awesome transparency and chipboard embellishments; loving especially the ones with the silver and even added more silver to the layout with sequins (I’m currently addicted to all things metallic and sequins). And of course, more silver here too… (how awesome are those transparency flower die cuts, the petals are transparent and the middle has a lovely coat of silver). For my title, I used the silhouette machine to cut out the “heart” this (die cut file from studio calico) and for the journaling I used various sticker elements (and of course, more silver here too). We will have more wonderful projects from Piradee this month, but in the meantime, be sure to visit her blog The Scrapper in Me for some daily inspiration. Check this out - you can still join in our February Sketch Challenge with an AWESOME prize pack for 3 lucky winners. Find all of the details HERE! Have a wonderful and crafty weekend. We are so happy Kris included this close up, because it is so cute and funny. Really speaks to the need for an adorable line of children's belts, but then there wouldn't be moments like this. Kris also created this page based on a sketch by Kim Keane at My Creative Sketches. Please stop by the BLOG to find all of the information and maybe even jump into the sketch challenge - they are offering quite an amazing prize. We love all of the layering and texture on this page. 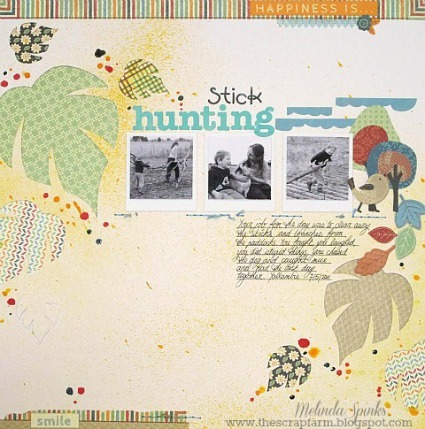 Kris did a wonderful job of adding the Winterings Paper Crafting Kit to the page. The layered burlap embellishment adds such a soft element to the page and really frames the adorable photos well. How awesome is that vellum strip with words on it??? We think it adds a great sentiment without a lot of fuss - almost like a rub-on. 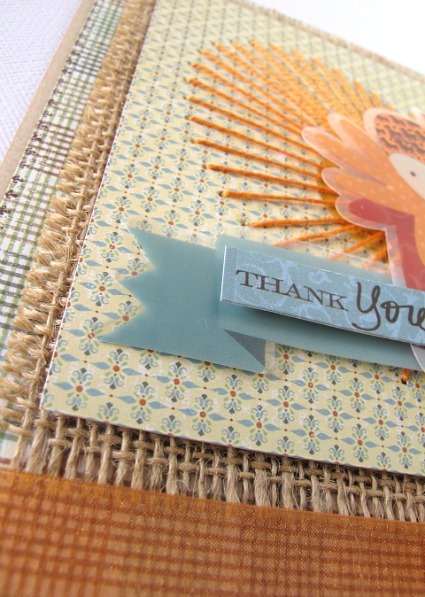 Please be sure to stop by Kris Berc's blog A Stash of Pretty Paper. She always has a fun project to share. REMEMBER - tomorrow is the deadline for our latest Cycling Team Call for our two Fern and Forest Collections. Please send your application to designteams@mylyb.com if you are interested in being a part of this great program. LYB: Do you scrap chronologically or out of order? JC: I tend to scrap whatever I want whenever I feel like it but I do keep my albums somewhat in chronological order. I think if I tried to scrap chronologically I would fall trap to the myth that I need to be "caught up" on my photos. LYB: Sit down or stand up scrapbooker? JC: I definitely sit down. I like to watch movies and tv shows while I'm working and it's just more comfortable to me to be sitting. JC: I am not much of a technique scrapbooker but I love to use my sewing machine to add texture to my projects. I tend to sew through my alphabet stickers on my layouts. I like that it helps ground them to the page. These are photos of my twin girls last fall during our first snow. They were so excited to be outside playing! I made the photos black and white to better coordinate with the Winterings collection. I also created the page on an angle for a twist. I LOVE the transparencies in this collection - the tree and icicles provide the perfect wintry touch! Please visit Jill's Blog Blessed Scrapper for more amazing ideas from her. Christmas 2011 - When I saw the wreath design on the paper I knew I had to add the little circle chipboard pieces to the arrangement. I then added the Foil frame to nestle the picture of my kids around the tree into the wreaths design. With the addition of the vellum tape and a few clear cuts and chipboard pieces I was able to keep the focus on the gift my children are to me, even though Christmas is a little chaotic anymore! O Christmas Tree - When I saw the designs on the Vintage band paper of the Children and the tree I wanted to use those to spotlight our own Christmas. With the addition of a few other pieces of paper I was able to document the highlights of our Christmas. The Chipboard shapes were the perfect addition along with the journaling cards to finish up my page. Christmas Village - When I first received my box of goodies, this is the project that I knew I wanted to embark on. I decorated my house and then the tree was born and they looked so neat sitting together that I combined them into a whole village. I started by covering my house with paper, making some windows, and cutting the different elements from the paper. Once I had the basics done, then came time to play with all of the amazing embellishments that LYB is known for! Thanks again LYB for the opportunity it was amazing! Please visit Wendy's blog On the Road to Destiny for more inspiring ideas. Every year I always look forward to the Little Yellow Bicycle Christmas collection because these collections are always so special. Once Upon A Christmas is so unbelievable. I love the elegant feel to the paper. I had been saving this picture of my two boys and Santa. I just loved this photo of Santa whispering in the ear of my little one who was so excited to see Santa. To frame the photo I made 3 areas on embellishments. I really loved layering the chipboard shapes, the fabric favorites and the clear cuts. They really worked well together. I don't know about you but I love the presentation of my gifts. I so enjoy making wonderful gift card holders and beautifully wrapped presents. Today I have 4 different gift card holders using my Silhouette. The paper works so well in creating the gift card holders because of the heavy weight of the paper. The boxes will be sturdy. To make these wonderful gift boxes I started with my pattern paper and added embellishments and tags from the collection. The journaling cards made the perfect tags for the boxes. These boxes will look perfect under your Christmas Tree this year. Thanks so much to everyone at Little Yellow Bicycle for giving me this wonderful opportunity to join the cycling team for Once Upon a Christmas. Everyone was so wonderful and I had such a wonderful time. Thanks again and Have a wonderful and Merry Christmas! Please visit Mary Pat's blog Siehled With a Kiss for more about her and ideas behind her work. I just loved Once Upon A Christmas. It’s a great, classic line. The neutrals and tone-on-tone designs make mixing and matching a snap. The line has lots of options to go monochromatic, too, if you like that look, and I do. For my altered project, I made a trio of holiday ornaments. I love the red cardinals featured throughout this line and wanted to spotlight the pretty birds. To make the two smaller ornaments, I used the “hanging wreaths” patterned paper and two round frames from the chipboard shapes. I pop-dotted the paper and chipboard together to give a little dimension then embellished the ornaments with sentiments and bows from the clear cut shapes. To make the large ornament, I used the Vintage Santa paper in the frame, then embellished it with a tag, a vellum tape pennant and a cardinal from the fabric favorites. When I opened my cycling team box, the first thing that caught my eye was the dark brown houndstooth paper. It’s retro, stylish and all around fabulous. I went to work with it right away. It made the perfect cozy backdrop for this holiday photo of my sister and son on a carousel ride. My son’s sweater featured reindeer and snowflakes so I pulled both of those into my design. On this page, I used a journaling card as a decorative element for a cluster of items, including a little pennant made from a vellum strip and a stick pin. For a title, I used a hanging tag, embellishing it with a sticker and punched snowflake. For my next project, I made a holiday card. As soon as I saw the red damask paper with the large sentiment, Merry Christmas, at the bottom, I knew it would be perfect for a card and I set aside that paper. To make the card, I trimmed the sentiment from the damask paper, added a bit of red houndstooth, and a vellum strip above it. An accordion flower from the Paper Crafting Kit added some dimension to complete the card. I want to thank Liz and the LYB team for inviting me to ride along with this collection. I had so much fun. Happy holidays, everyone! Please visit Izzy's blog Write, Snap, Scrap for more of her inspiring work. 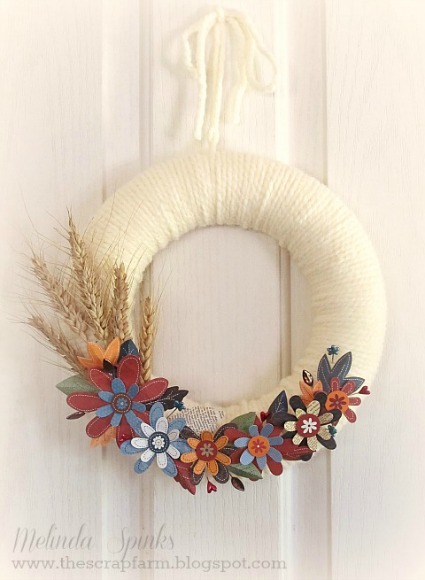 Today we have the final project from our talented Acorn Hollow Guest Designer Kelly Goree that was inspired by her friend and author Courtney Walsh's new book A Sweethaven Homecoming. We have loved having these two women team up for some really great ideas, words of wisdom and great prizes. Courtney Walsh has written a series of heartwarming novels with themes including friendship and scrapbooking. Today she shares some insights from her Sweethaven books about home and has asked her good friend Kelly Goree to create a layout about the theme with our very own Acorn Hollow collection. From Courtney --- As an author, it's hard to pitch a story idea that starts with loss. But it's such an important human emotion, and one we can all connect with. I chose to start my novel with a profound loss, one that radiates throughout all three novels...because that's what loss does. Like a ripple made from a stone thrown into the water, its effects keep moving outward. But "loss" isn't only a difficult subject to write about. It's also difficult to scrapbook about. Sometimes our most precious photos are the ones that are hardest to look at. Really important memories are like that. There's something almost sacred about putting them down in your album. Still, I believe scrapbooking your grief is almost like therapy...and it has so many benefits. Kelly pulled from this aspect of the Sweethaven novels with her incredibly touching layout about her father. A layout that wasn't easy to create, but one she will surely cherish forever. 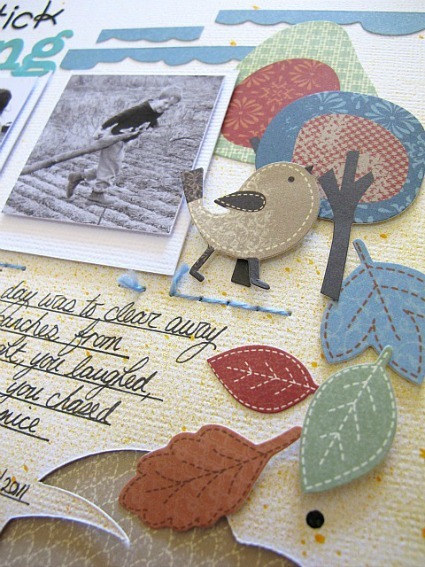 Kelly created this page withour gorgeous Acorn Hollow collection which can be used for both autumn and everyday layouts. 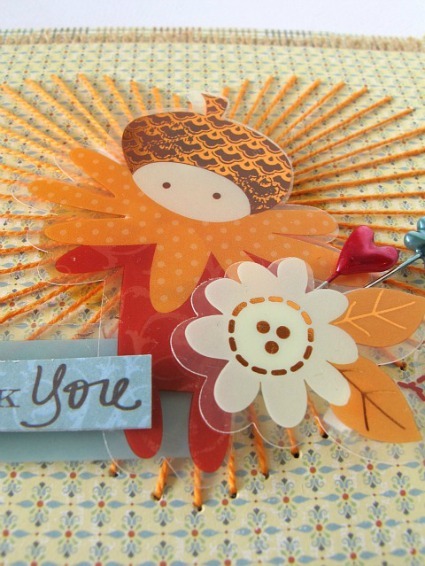 We especially love what she did with the fabulous Acorn Hollow Paper Crafting Kit. Journaling ---- I scored tickets for my football-loving father to see the Tennessee Titans play so you came to Nashville for the weekend to go. This photo was taken while we were tailgating – just before we walked the few blocks to the game. Those few blocks were hard on you and the few blocks back were even harder. I knew something wasn’t quite right, but I had no idea that that weekend would be the last time I ever saw you or that this photo would be the last of us together. Looking at this photo now I can see how sick you looked yet I treasure it. And while it hurts so much to look at, I’m so very grateful I have this. GIVEAWAY 1 - We thought that the cover of Courtney's second book A Sweethaven Homecoming reminded us of our Acorn Hollow collection, so we are going to giveaway a copy of her book. Just tell us what you think about Courtney's thoughts on scrapbooking loss and we will choose a lucky winner from the comments. GIVEAWAY 2 - be sure to add some praise for Kelly's project in your comment for a chance to win our entire Acorn Hollow collection. We'll choose a winner early next week! Laura Bos said...Home is often messy, home is warm, home smells good -- although sometimes it's a picked up pizza and not homemade. Our home is not perfect, but it houses our family and all its love, so it's perfect for us. Also - if you cannot find Acorn Hollow at your local scrapbook store, you can buy it directly from us HERE. Check back tomorrow for another 12 Days of Once Upon a Christmas project from our Cycling Team. We are so lucky to have another project from the super talented Kelly Goree that was inspired by her friend and author Courtney Walsh's new book A Sweethaven Homecoming. Having moved around a LOT the past few years, Home is more important to me than ever...which is why for this second Sweethaven-inspired prompt, I asked my sweet and hugely talented friend Kelly Goree to create an Acorn Hollow layout that highlights the things she loves most about her home. I didn't expect that topic to strike such a chord, but for Kelly, it's the home itself that has the most meaning. Having been in her family for four generations, there's something special about those four walls...and what better way to document it than in the pages of her scrapbook? From Kelly--- My favorite thing about my home is my home itself. It was once my grandmother's and four generations of my family have lived here. The layout is a replica of my house and the doors and windows open to show you some features and give journaling about why this house is special to me. The detail shot of the front door pretty much shows you exactly what you see when you open my front door which I thought was fun. Please visit Kelly's blog Behind the Pages for more amazing ideas and inspiration. GIVEAWAY 1 - We thought that the cover of Courtney's second book A Sweethaven Homecoming reminded us of our Acorn Hollow collection, so we are going to giveaway a copy of her book. Just tell us what home means to you and we will choose a lucky winner from the comments. GIVEAWAY 2 - please visit Kelly Goree's BLOG for a chance to win our entire Acorn Hollow collection. It's her birthday today, so be sure to wish her a happy one! I'm finding it a bit sad that this is my last post with Acorn Hollow on the blog! I just love how adorable and versatile this collection is! You can be sure that I'm going to be holding on to everything that I haven't used and you'll be seeing it again in my galleries and on my blog. I couldn't resist this sweet picture of a friend and her daughter that was taken last Thanksgiving. I wanted to have a place for her to journal herself and her daughter, so the 5 things pocket was the perfect solution. As I was putting the page together, I thought about how cute the shapes and details on the inserts were. I just made sense for me, the ultimate shape lover, to use them in my design as a banner instead of the intended way in the envelopes. I also layered the 5 things large shape with journaling card and topped it with a few pieces from the chipboard, paper crafting kit and even a clear cut for some added interest to my page. Because I already had a place for journalling I used the yellow journaling card as an added embellishment and simply added the names and date. You might notice that the white flower is a clear cut shape. I chose to add a foam dot behind it and was careful to chose one that fit inside of the 'stitching'. 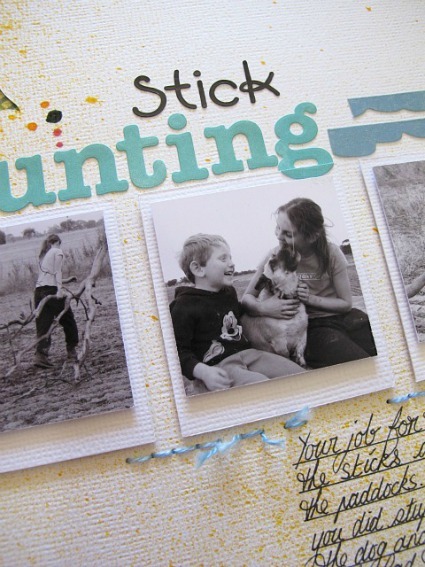 Popping up clear cuts is a fun thing to do and they stand up beautifully to the test of time in your scrapbooks. They are very tough to bend so they are actually a really great way to add some extra dimension. Clustered embellishing in the lower right corner completes the balance of this layout. I mixed both the paper crafting kit and the clear cuts to this corner. Another tiny detail is the pop-up center of the white flower. I used a small punch and made the center from the Button, Button! paper. You might have noticed one on the other corner, too. It's a tiny little detail and finished off the centers of my flower with the colors I wanted to add in those small spaces. Please visit Robbie's blog Just the Scrap for more ideas and inspiration. Remember that if your local LSS is out of Acorn Hollow, you can still order direct from us HERE. Have a wonderful post Halloween day! One of our Halloween traditions is to carve pumpkins before trick or treating. I don't like moldy, sad jack-o-laterns so the day of is when the carving must take place. I have tried to teach each of my girls how to get a perfectly cleaned out pumpkin, but only my youngest is showing any signs that she is following in my pumpkin carving lovin' footsteps. Acorn Hollow is one of my favorite LYB lines to date! I love the earthy colors and the copper foil effects totally ROCK!! To stretch the life of this product line I added a fun Halloween twist. The owls became witches with little paper pieced hats. I love when it all comes together easily and this page was a quick one. Happy Halloween! Last year's Superman is this year's hero to be named. My son is a little obsessed with super heroes and was only too happy to be the cape wearing Superman, but this year he is between Spiderman and Thor. We will just have to wait and see which costume he chooses (since he conveniently has both stashed in his closet thanks go overly helpful relative if you KWIM). Love how the subtle blue colors in the Acorn Hollow collection can compliment this bright blue costume where other Halloween specific collections might clash with the man of steel. These owls are just way too cute for their own good! Had to have them perch right over the hero himself. They are the watchful eyes of all the Halloween mischief and fun! Use the banners in the Paper Crafting Kit to make a fun title. These banners fold and pop off the page, so I thought it would be fun to make a play on words for the title and instead of All Hallow's Eve, we have Fall Hallow's Eve. I know...corny! Don't forget the darling chipboard leaves to add some detail. It wouldn't be Halloween without pirates! Use your Paper Crafting Kit and Journal Cards to make a fun pirate emblem. The distressing on the patterned paper also makes a perfect "aged" background almost like a treasure map for the little swashbuckler. We are so excited to share more Acorn Hollow projects from our Cycling Team! Today we are so fortunate to have returning Cycling Team Member Kris Berc as our designer. We just adore her work and it has been so fun to watch her little girl get bigger each time Kris shares her work with us. Anyway - we want Kris to tell you all about it. Hi everyone, it's Kris with you today. I am so grateful to have been invited back for another ride with the Cycling Team this month! I had an absolutely wonderful time creating with Acorn Hollow. The colors and patterns in this collection are just gorgeous and layer together wonderfully! 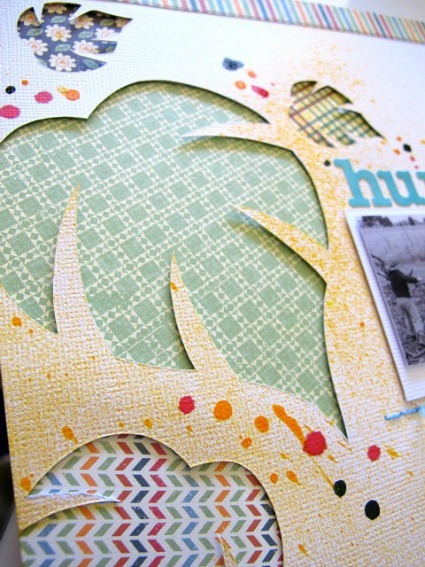 I adore the beautiful Acorn Hollow papers and embellishments so much... I couldn't resist squeezing as many of them onto my projects as possible! 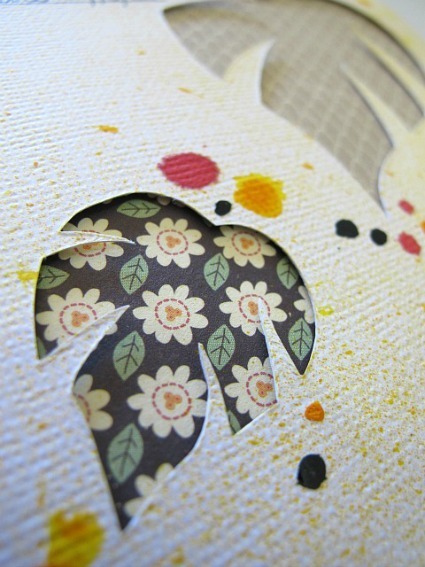 To create this layout's background, I layered 5 different pieces of the patterned paper. I used the "Fall" chipboard letters for the title. Can you see the pretty flourish detailing on the letters? They come like that! Little Yellow Bicycle's paper crafting kits are brilliant! Included is a large variety of pre-cut and pre-scored flowers, leaves, strips for accordion folded flowers, and other shapes. Without a doubt, these terrific kits are my favorite of Little Yellow Bicycle's embellishments. I've layered several of the flower pieces and leaves in this cluster, using foam squares behind many of the pieces for added dimensional interest. I've also included some chipboard shapes and a clear cut acorn. Tucked in the middle of it all is a cute blue flower-shaped stick pin. This cluster consists of an accordion flower and leaves from the paper crafting kit, as well as some chipboard shapes and a cute little acorn from the clear cuts set. I used foam squares behind the above 3 cardstock stickers. The debossing included on these stickers is a wonderful detail! For my second layout, I chose another set of 5 different patterned papers to layer for the background. I love to layer papers! Here are some accordion flowers, layered flowers, and leaves from the paper crafting kit along with some cardstock stickers adhered with foam squares, chipboard leaves, and a totally adorable chipboard owl. See the cute red heart stick pin? Love those! I stuck it through one of the foam squares- don't want anyone to poke any fingers! I layered 2 of the journaling cards and embellished them with some clear cuts flowers, a chipboard flower and acorn, and a super cute cardstock bird sticker. I tucked the cards a bit behind the photo (tip: adhere your photos using foam squares so that you have plenty of room underneath the edges of the photo for tucking embellishments in!) and then topped this cluster off with another sweet little owl chipboard piece, a foil-accented chipboard heart, and a clear cut heart. The "family" chipboard piece is adhered at the bottom of this embellishment cluster with a foam square. Thank you so much for taking a peek at my Acorn Hollow projects today! A great big heartfelt thanks to Little Yellow Bicycle for having me along for another ride! Happy Fall to all! Please visit Kris's blog A Stash of Pretty Paper for more inspiration. Now for the latest winners of our giveaways! Please email your information to liz@mylyb.com and we will send out prizes soon. Friday Post with Courtney Walsh and Kelly Goree - Marie said "I have a wonderful friend that introduced me to scrapbooking. While I was in the process of waiting to adopt my daughter from China, we would get together weekly to scrapbook, and talk, of course!! When my daughter arrived, I had 3 scrapbooks started (one for our family, one for my parents, and one for my in-laws!!!) and we continued to get together after she arrived to continue with the books! She remains my best friend today!" LYB/Xyron Monday - Tami McDaniel said, "This card is so cute. I love my Xyron. I gave one to my daughter too, since she is a teacher. Thanks for the chance to win. Tami"
LYB/Xyron Tuesday - Judy R said, "I have LOVED Xyron products since the very beginning! I NEED the new sticker machine!" LYB/Xyron Wedensday - Susan Wojtkowski said, "LOVE this layout..so clean and fresh, yet colorful! I want to get my hands on one of those Xyron machines....I can see all sorts of ideas swirling in my head to do with it!" LYB/Xyron Thursday - Kathleen Schriber said, "i've been papercrafting for a long time, and you just taught me a new trick to glueing those circles. I never thought of that...thank you! (always) glued 1 circle at a time....duhhhh! awesome trick!" Beverly Jordan said, "Loving the blog hops." Elizabeth Parham said, "My best friend gave me a Xyron Magic Sticker maker for my birthday - I love it !" Mary Lou Holshouser said, "Just finished the blog hop. I love the Acorn collection. Just looking at the paper makes me feel happy. the birds are singing and the flowers are blooming - a relief from the cold we are having now." Don't forget you can buy the Acorn Hollow collection directly from us HERE. Stick with us all week as we continue to share projects for Acorn Hollow! If only I could go back to 2009. My sweet little guy warms my heart on any cold day! Even though he is older, we still follow the same family traditions. I live in Sunny California, so it is sunny all year around! However, the Acorn Hollow collection is perfect for documenting your pumpkin patch photos, too. On this page, I wanted to keep the emphasis on the photo. I kept my embellishments off to the left hand side of the page. One thing I love about LYB are all the embellishments that coordinate with the papers! I pulled my title from the journaling cards packet. I layered this on top of a scallop I punched from the coordinating 6x6 paper pad. There are lots of layers surrounding my title, and you can see how easily it is to build dimension, simply by pulling from the papercrafting kit, and the clear shapes. I fell in love with the leaf diecuts, and tucked them underneath the title. You will also see a bit of them in the bottom lower right hand side! This collection is full of browns, greens, and oranges! Just in time as the weather begins to change! 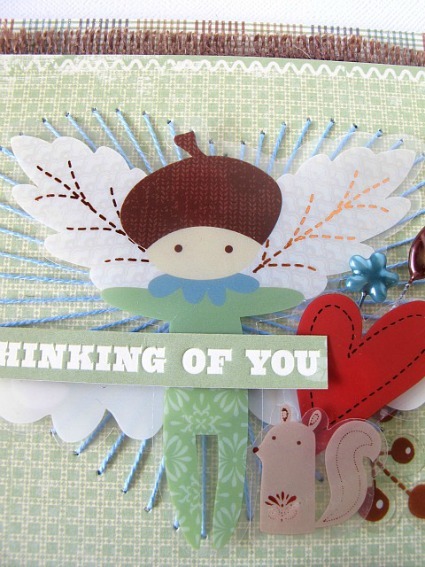 Please visit Suzanne's blog Scrappin' the Details for more inspiration. Layering is one of my favorite techniques to use on a page. Overlapping and clustering elements adds interest to a layout and gives it a nice cohesive look. Even with the number of embellishments I used on here, the photo still takes center stage. 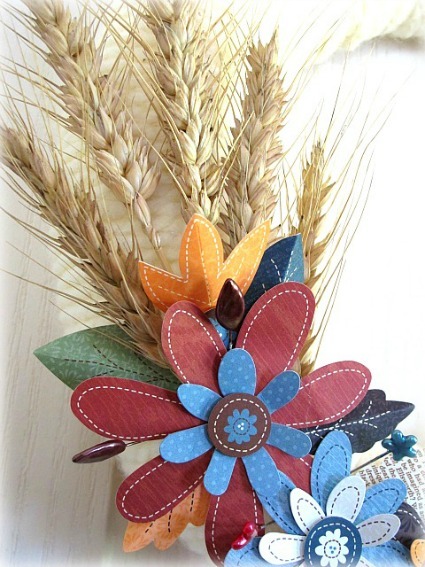 Other ways to change up or enhance embellishments are: add a rhinestone or pearl center to a floral stick pin or use buttons at the end of a banner to add some texture and dimension. Please visit Lisa's blog Remembering the Good Times for more ideas and inspiration. Get Ready for Acorn Hollow! Fall in Texas can be a bit unpredictable, but all in all it's usually in the 70's/80's and we spend a lot more time outdoors. Each year we make the trek from city life to country life and enjoy a day at a local farm, where you can interact with farm animals of all kinds, take a hayride, pick you own pumpkins and soo much more. It really is a day's worth of fun fill activities. One thing we always love to do is climb up on the tractors and pretend to be tending to the crops. The Acorn Hollow collection is great for all your fall photos but it's very versatile with the rich colors. Perfect for any nature lover as well. The journaling cards in this collection are soo cool...some have foil on them and others have fun decorative edging. I used mine to feature some hidden journaling, which I wrote on after this photo was taken. For this fall layout I created my title using my Silhouette software. Nothing fancy to it really! To create your title type out your letters using the text box, right click and "un-group" your letters. Layout your letters and shapes so they are overlapping or touching on an edge somewhere. Then select all and click "weld". It might take a few tries! Just keep moving your letters around until they connect. Once they are welded select all again and choose "group" that will keep all your dots and things together for cutting. I really love this line and how awesome the colors and patterns are for creating Fall projects. Get this collection today right HERE! KN: I make a HUGE mess while I scrapbook, but have to clean it up after every project before I can start on another. KN: American Craft is by far my favorite adhesive! KN: Chicken wire. I stamped with it once. I really love working with patterned papers and using as many as possible, with out over-doing it on a page. I created a fun border across the bottom edge like a large arrow pointing up to my focal point of the page, which is the photograph and Title. Visually, I like to create a triangle with embellishments, to help guide the viewers eye around the page, yet keep their focus on the photograph. Giveaway - Now, come on over to my blog Capturing the Moments and leave me a comment to receive a full set of this AMAZING line for Back to School! This has been a big year for me as a mom. My youngest started school. Real school. Kindergarten. We made the decision to make her wait an extra year last year so she would be the oldest in her class instead of the youngest, which was the right thing to do, but I think it made it even harder on me. Because I had her home with me (except for half day preschool) longer. She is of course thriving, but I am still amazed everyday that she is big enough to walk into that school with out me, that she can carry her lunch tray all by herself and that her huge backpack doesn't swallow her. Here she is on the first day of school, barely letting me take a zillion pictures of this big day. An easy way to create a layout is to use a grid as the base. The paper squares on mine are 2.5 inches. I do not try to have them all line up perfectly so it takes a lot of the pressure off. Then you have little boxes to embellish with all the fun stuff in the line. She is really into owls right now so those were a MUST on this layout. I love all the bits and pieces of school stuff in the Makin' the Grade line. The papers are so authentically school too. Some, like this reminding me of the old green chalkboards and clapping erasers at recess. Please visit Corrie's blog You, Me & Crazy for more of her wonderful ideas. Today our Biker Chicks wanted to show you how you can use or mix up any of our collections to create a Fall project. We know our fans have a lot of LYB lying around the scraproom, so we thought it would be fun to repurpose some of our older collections. Living in Texas, back to school means football season! I have a million football and cheerleader photos from my kid's years in school. I thought it would be fun to mix up the Makin' the Grade collection with the Get Your Game On collection and I couldn't resist adding in a chipboard frame from the Escape collection. Tip: I made the flowers by just drawing them on white cardstock and then cutting them out. I LOVE the way that the Sakura Glaze pens work for doodling heavy. I also really love the deep black color. For the white doodles, I used the Sakura Souffle Pen. There are a few great choices for white pens, but I like the touch of texture that the Souffle Pens add. When I think of Fall I not only think of the change in weather and colors I also think of family and FOOTBALL! Fall is a laid back time for us and we spend a lot of Saturdays and Sundays with family. For this layout I used the Saturdays collection to showcase this sweet photo of my friends little girl. She is sporting her Redskins jersey and playing with her Momma in the leaves. I love the colors of this line. They are classic and can mix well into a lot of different themes! To make mixing and matching products between collections effortless, I just choose two or three colors as the main focus of my layout and then scan through the product choices picking out relevant embellishments that fit within those color choices. Along the way, I also choose muted and neutral tones that will work well with any color choices. It’s very easy to brighten up fall jewel tones with pops of white and soft pastels to end up with a fun and colorful fall-themed layout. Can pink be a fall color? Why not, it's the color that a lot of kids wear and is only slightly lighter than red. That is what I thought when I pulled out these photos of my daughter from a trip to the park a couple weeks ago. I love all the green and brown hues in the Paradise collection, so why not add pink to the Fall palette? In fact, pink is the new red - lol. I mixed in some of the corrugated chipboard from our Hello Fall! collection to ground the brighter colors and add more of the Fall elements to the page. This squirrel has got to be one of the cutest things ever! I just added a bit of bling for the eye and added it to the page with some foam tape. Geet out some of your LYB and have a wonderful and crafty day! We are so happy to have Kimberly Neddo as our guest designer for Makin' the Grade. If anyone would know a lot about back to school, it would be this mother of 6. Kimberly's blog banner is tribute to all of her kids, so we thought she would be a great fit for sharing some of her school moments. But before we share her work, we asked her a few questions to get to know her better. KN: Twine or some kind of string. Love what it adds to a page. KN: Hip hop and Pit bull…LOVE to create with Pitbull and his remixes in the background. 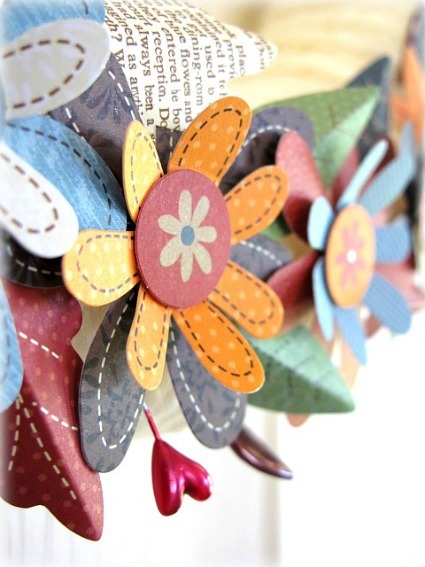 We really love how Kimberly used our Makin' the Grade paper flower kit. The sprawling flowers are great to mix with sentiments, but don't add too much clutter. Kimberly also added one of our signature clear cut shapes to her page and made a fun banner cluster. The grays in this collection are such a great color to ground the brighter, primary colors. Here Kimberly paired yellow accents which pop off of the gray patterned paper and make the beautiful photo stand out front and center. We love how personalized Kimberly's journaling is and how she uses her own handwriting on her pages. Our Biker Chicks have been busy creating two page spreads using our school collection Makin' the Grade. I take a quick picture every morning before school of my kindergartener. I thought it would be a fun project for this year to see her changing each day. So far it has be hilarious to see her funny faces and moods. This is week 3. Making the Grade was PERFECT for these school pictures of my girl. Hi LYB Fans! Jen here with another Making the Grade project. Today I wanted to showcase one of my favorites ways to create a title. It's a hot trend right now to create titles and shapes with your die cutting machine and using that negative. It gives the layout a unique feel and dimension. For this sports themed school project I wanted to use the school name and mascot. I did a simple design in my Silhouette software using Georgia font. I cut the title directly into my background 12x12 paper then lined the backside with a contrasting color paper. You could also line your contrasting paper with dimensional dots to give your title a 3D look. I chose to keep it flat and instead created depth with my other elements. I add several layers of dimensional dots to my photo to have it stand out above my embellishments. If you don't want to use that many dimensional dots you can also create the same look with scrap paper. Simply fold your paper into a tri-fold leaving the paper "puffed" then simply attach it to the backside of your photo. By making the photo the "top" element it is sure not to get lost in the among the other elements. Today a few of our Biker Chicks wanted to share some summer projects with some of our favoraite LYB summer collections to celebrate how we are spending our time. Biker Chick Corrie Jones made this wonderful multimedia page with our Splash Collection. We had the most amazing week at the beach this year. Well, every year is an amazing at the beach, but this year we tried something new - 4 wheel driving on the beach. It was one of the coolest things I have ever done. We were supposed to be looking for wild horses and we did see about 20, but my favorite part was being out in sun in a Jeep, driving all over. I HAD to use Splash for this page. So I scraped together the last pieces I had for this page. I love the colors in this collection. It is definitely one of my favorites for this summer! Remember our Sweet Summertime collection? LYB created this adorable little Banner Album with all the paper cut to size so the focus could be on embellishments, which is exactly what I did. Even though most of the work was done with the precut elements of the album, I wanted to give it a handmade feel with the custom stitching and twine. Use the blue precut banner paper and backstitch around the design. My family and I had such a great day on the lake and the colors of the Sweet Summertime Collection perfectly compliments the colors of our day. I love the way twine looks wrapped around pages and cards and thought it would be fun to wrap this mini album page. I also love how you can twirl the longer ends of the twine around a project, so I used the Tombow glue to stick the longer ties from the bow in a swirled pattern. For this page, I wanted to combine the chipboard sentiment with the fresh verse sentiment to capture the moment of my kids snuggling in the boat. The journal card makes a fun photo mat as well as a way to add some specific details from the day. My husband did a great job of captain and this page is meant to honor his part in the event. 4 x 6 photos were just a tad too big for the chipboard album, but I found if I cropped them to be 4 x 5, they were a perfect fit. I love scrapbook pages with multiple photos and wanted to create the same effect for this page, so I added three wallet-sized photos to show more of the event. The Tear Out Ticket sentiment was a great photo mat to tie the page and photos together. Had to end with a simple page about my son and since the banner page is pointy, I added a lot of round elements to balance the effect. I tend to love larger journal cards, because they can be a great focal point in a mini album and take the place of a photo. This one was a fun way to add a thought and then include embellishments that might over power a photo, but not the journal card like the kite and the cloud. The twine looks fun tied through the chipboard button. We have some more great ideas to share from our Escape Collection Guest Designer Kathy Martin. We have been getting to know her over the past couple of weeks and we have a few more question and answers to share. KM: I’m fairly neat and organized, but I do whip up big messes. I keep the mess under control by cleaning up after most projects. KM: Forever! Well maybe not forever, but it takes a long time. As I mentioned above, I don’t plan out my pages or use a sketch, I like to play around and wing it as I go which can take a while. KM: I love them all! I haven’t met a scrapbooking magazine that I didn’t devour from cover-to-cover! We are in love with how Kathy incorporated our Flag and Paper Flower Kits on this amazing layout. Even though she used a lot of the product, she did it in such a way that it still looks simple and clean. Kathy always has fun things going on at her blog Card-Blanc, so please stop by for a visit and more inspiration from her. We will be back next week with her final project. On National Scrapbooking Day Little Yellow Bicycle asked what projects our readers would like to see. One of the most popular answers was double page layouts. I think this may be my fifth ever double page spread! For some reason two pagers really intimidate me. So for this spread I decided to look at it as an expanded one pager. I created the one page feel by splitting the die-cut paper in the center of the layout. I then used a 4 inch strip across the two pages to connect them and line my photos. I tucked the smaller decorative edge paper underneath that strip to make it seem longer and add in another color. When I look at the layouts it almost looks like it could be two pages separate. I guess in my mind that made it easier for me to place my titles and embellishments. What are you tips for the perfect two pager? I would love to hear your ideas! Photos from the Booth! CHA Sneaks! Just a quick post on this last day of CHA to share some pics of the booth before the show's over and we have to take it all down! Leave a comment for another chance to win! Escape page by Biker Chick Robbie Herring - Description: I couldn't resist using this travel collection for a layout about my daughter's journey into the real world instead of strictly for a travel page. I loved how all the colors in it worked with my picture of her leaving for her first interview after graduation from college. Escape page by Biker Chick Corrie Jones - "I love the colors in The Escape! They are just happy, which is perfect for all the summer traveling we are doing. It seems like we are in the car going someplace all the time!" This photo of Jenny and her family on vacation is hilarious and we love how every bit of it screams Splash as the perfect color palette to compliment the photo. We also love Jenny's creative ideas for using our Splash die cut. This page design makes a fun focal point for the photo and makes a great place for the title. Please visit Jenny's blog Say Chez! for more inspiring ideas from her and maybe a few glimpses of the wee one. Have a wonderful weekend. We will be announcing our new Escape Cycling Team on Monday. When I first saw the Splash collection, I immediately thought of the beach. It is my favorite place in the world and these amazing blues and greens are perfectly beachy - if you ask me! I took this picture of my view one morning as I sat peacefully before the crowds showed up. It is just an iPhone picture, but the colors really are amazing. Perfect for these papers. I used my Silhouette to cut out the circles from kraft cardstock. Behind that I used different papers - both 12x12 and from the 6x6 pad. The cute cardstock shapes, clear cut shapes and flags are perfect small embellishments to keep with the beachy theme. I used a cardstock sticker saying "Life is better at the beach" for the title. Ah, it makes me want to head out! I am ready for my vacation! This collection has so many fun pieces - and just in time for summer! Please visit Corrie's blog You, Me & Crazy for more creative project ideas. The Splash Collection is such a great mix of colors for summer photos. All the bright colors and adding in the tan accents makes it just right for beachy pictures. It's such a happy collection! Just laying it out on my table to get started made me smile and think of summer vacation. I chose to use the round die-cut paper as the background for my layout. It is just sooooo cute and I thought it would frame this picture perfectly. Because her little bathing suit is a floral print, I wanted to cluster some of the felt flowers with some beach accents. I like that there are so many options in the collection to fit any picture included in Splash! When clustering, I like to have lots of overlapping and different heights. After adding the flags and flip flops, I needed a bit more height for the navy flower. A foam dot made it sit just right over these embellishments. Another little piece of detail was leaving one of the orange petals under the stitching bordering the photo. Tip: You might notice that the embellishments along the bottom of the page extend beyond the paper a bit. A good way to make sure that when you extend your embellishments or design beyond the page that it will fit in your scrapbook is to simply lay your page onto a 12x12 piece of cardstock while you are working. I added more detailing to my layout with a few simple stitches over the clear cut sun. I used the little x's to do double duty to attach the clear cut. I even chose the red to add a border around the photo and added a few more x's around the page and a few red buttons to pull the design together. Tip: Although my photo doesn't have any red, the collection has some red accents. There is no reason that your embellishments and details have to be the exact same colors as your photos. Please visit Robbie's blog Just the Scrap for more crafty inspriration. Have wonderful and crafty weekend! We are finally ready to share our amazing Splash collection! Wait until you see what our Biker Chicks have created to inspire you to play outside more and splash around! The Splash collection is so much fun with it's great colors and cute embellishments. It was perfect for these pictures of my girls at our first lake day of the year, just this past weekend! Loved these sweet photos of my friend Becky Thalgott’s boys. They went perfectly with this fun line…. SPLASH!!! Thank you Becky for letting me scrap your photos! This line has so many possibilities….. I can’t wait to create some more fun summer projects with it! We got an adventure of a lifetime doing something as a family that I’ve always wanted to do – swim with the dolphins. It took some convincing to get my daughter in the dark water lagoon but once she was in she had the best experience! I knew that I wanted to mimic the waves in the water and the Makin’ Waves paper can a great water rhythm to it so I cut the waves from the paper and just layered them on top of each other until I got the look I was going for. I secured them with a dab of glue and then machine stitched over them in 5 coordinating colors. I kept the ends of the threads on purpose for 2 reasons – 1. I thought they added to the effect of the waves and 2. I didn’t feel right just abruptly ending the waves where they meet the photo but I also didn’t want to extend them across the entire page so I stitched on the right side of the photo to fade out the waves. I then highlighted the other photos and my title by distressing and stitching paper from the 6x6 pad (they’re not just for cards anymore! ).Before I added my photos, I splattered blue and white mist over the papers to resemble water being splashed by the waves and dolphins. Thank you to our Biker Chicks for making a big SPLASH today! We hope you are inspired and ready to get out in the water! Have a wonderful and warm day today. We are so pleased to begin sharing the designs of our newest Cycling Team - Hello Spring. Today we have some wonderful layouts to share from designer Elizabeth Carney. Here is what she had to say about working with our kit. "Working with this kit was amazing! I love the fresh fun colors and how cheery everything was, it made for some really happy pages!" Supplies: HS-220 Fabric Favorites - self adhesive, HS-108 Teal Tweets/Green Grass Linen, HS-109 Pretty in Plaid/Tulip Linen, HS-140 Cardstock Stickers - Fresh Verse™ - with glitter and debossing, HS-1100 Tear-out Ticket & Journaling Book - with glitter accents, HS-305 Paper Flower Kit. Supplies: LYB Decorative Edge cardstock, HS-103 Spring Story/Poppy Linen, HS-102 Garden Rows/Lilac Love, American Crafts cardstock, HS-220 Fabric Favorites - self adhesive, HS-305 Paper Flower Kit, Mr. Huey's Mist, computer font Tahoma. Please visit Elizabeth's blog Life and All that Goes with It for more inspring ideas.